Pack, zip, and transport household essentials with a clear view! The Sorbus Storage Bin set is the perfect way to store your clothing and household items. It features a front and top zipper opening, with two carry handles, and a large transparent front window. The generous size provides plenty of room for seasonal apparel, bedding, linens, holiday decorations, toys, accessories, and more. A fully zippered closure protects items from dust, pest, and water damage while the large clear window allows you to see contents at a glance. As a bonus, each bin includes a label holder to quickly classify what's inside. This set of two can be used individually or stacked together in your designated storage area. When not in use, simply collapse flat and tuck away under the bed, chest drawer, or closet shelf. Store out-of-season clothing or infrequently used items with ease around the home, office, or dorm. Don't let limited closet space cramp your style! Make the most of your wardrobe with folded garments neatly displayed in sturdy storage bins. 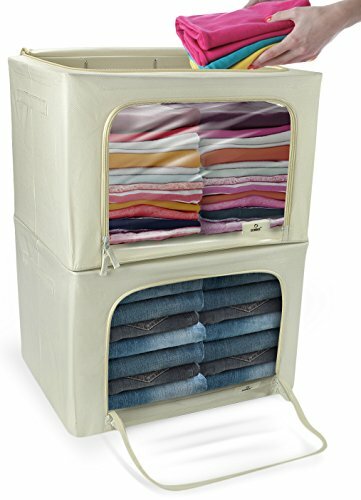 Whether used for sweaters, guestroom comforters, towels, or your favorite designer bags, these organizers de-clutter any closet, bedroom, laundry room, attic, and more. The convenient top opening makes it easy to load contents when placed on the floor, while the front opening provides access to contents while the bins are stacked. For easy transport, use the portable carry handles and label holder to identify contents as you pack around the home, office, dorm, or travel to the car. The stackable design maintains shape with a sturdy metal frame and folds flat for storage. To assemble, the metal frame pops open into a large storage cube bin. When not in use, simply collapse flat. Made of 100% polyester. Dust-proof, moisture-proof, and moth-proof with zipper closure. Clean with damp cloth, and air dry. Measures approximately 19.75" L X 16" W X 13.75" H.